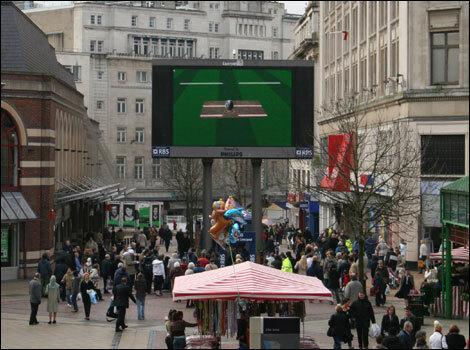 The BBC Big Screen in Liverpool is located in Clayton Square, close to Liverpool Lime Street railway station. The screen is one of 19 currently installed across the country - 25 meter LED screens with sound systems in prominent locations in city centres. 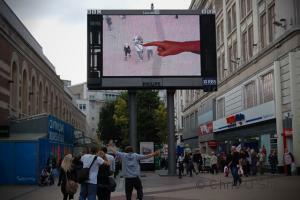 The premise on which the screens are operated is as a platform for all, to provide local information, and to allow film-makers and other visual artists a platform on which to display their work. The screens are run by the BBC in accordance with local collaborators. The 'screens' show BBC programming as well as screenings of locally made films, event information and sports coverage. Desktop resolution: 800 x 600 or 1024 x 768.